Home » Blog » WordPress » Will Gutenberg mean the end of WordPress page builders? We already wrote earlier on about the arrival of Gutenberg, but now that Gutenberg has been released it’s time for a second look. What is this new content editor exactly and which role will Gutenberg play in the future? An interesting question arises: does Gutenberg mean the end of WordPress page builders? It has been relatively quiet for years in the WordPress world, but this came to an end when Matt Mullenweg announced the project “Gutenberg”(named after Johannes Gutenberg, inventor of the printing press in Europe). Never before in the history of WordPress has the community been so divided (see the hashtag #wpdrama! )as when Gutenberg was announced. The team of developers, led by Matt Mullenweg, indicated that they would be focusing on a new content editor. When the first Beta version was released online, the community was not happy: the editor was too cumbersome and people had hoped to see different updates. In the State of the WordPress Industry 2019, we see that some people within the WordPress community still aren’t fully happy with Gutenberg. Why a new content editor? Experienced WordPress users sometimes forget that the learning curve of WordPress is steep. Installing WordPress, themes, plugins, security, speed, updates, hacks, backups and more: WordPress can no longer be called a simple Content Management System (CMS). However, this was the starting point when WordPress was created: a simple tool to blog on the internet. WordPress is no longer the nicest system for beginners, while other systems have become increasingly easy to use (Wix). It is – according to the WordPress Core team – essential that WordPress becomes more user-friendly, to prevent WordPress from only being used by techies in the future. TinyMCE, the “old” editor within WordPress. The old TinyMCE editor was a lot, but definitely not user-friendly. There was (often) a large difference between the content in the editor and at the front of the website. The TinyMCE editor is mostly focused on text and not on content. This is not strange: TinyMCE was developed in 2004 (!) and the focus was at that time just on a text. Today the focus is on content (images, videos, audio clips, etc) so the idea of a new editor is not that crazy. Gutenberg, the new content editor of WordPress. Gutenberg can conveniently be tried out through Frontenberg! Gutenberg has to solve two problems (user-friendliness and a shifting focus from text to content. A completely new editor especially developed for WordPress and built from scratch. The most important difference with the existing text editor is so-called blocks. For an extensive explanation of the new Gutenberg editor and the features, you can read our article about the arrival of Gutenberg. The list above with features look a lot like the description of an average page builder plugin. Page builders have increased a lot in popularity over the past few years, especially among agencies that develop websites for clients. Page builders do everything that the TinyMCE editor doesn’t do and are the foundation of many WordPress websites online. 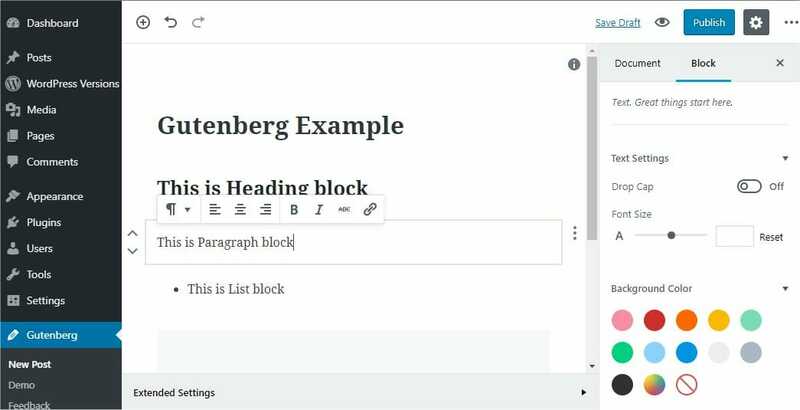 But now Gutenberg is here: the new content editor that makes many features of page builders accessible for the greater public. Does Gutenberg mean the end of WordPress page builders? At the moment: no, Gutenberg doesn’t mean the end of WordPress page builders. However, Gutenberg will attract a new group of users who – if they previously had wanted to post a full-width photo – would have chosen a page builder. Gutenberg will thus mainly for danger for the lowest segment of page builders (who have the lowest number of functions). This is not a bad development: the fewer WordPress users are reliant on external plugins, the fewer security risks this brings along and the faster a website will load. However, Gutenberg won’t be able (in its current form) to make the large page builders (Divi, Elementor, Visual Composer) disappear. The mentioned page builders have many more features than just placing headings, full-width photos and tables. Modern page builders support front-end editing, so users can really see how content in the back-end will look in the front-end. Gutenberg doesn’t support this. Gutenberg also doesn’t contain many special blocks like forms, MailChimp integration, and previously configured content blocks. Finally, Gutenberg isn’t completely stable: the editor was finished hastily and launched in December 2018, after which thousands of 1-star reviews were posted. Many errors were discovered and the release of Gutenberg was anything but quiet. But the developers of popular page builders won’t be fully relaxed. Gutenberg is still young and has the best team of developers: the whole WordPress community. It’s easy for developers to add blocks to Gutenberg, so it’s just a matter of time before Gutenberg will have a giant amount of previously configured content. Every day new plugins are released that add special blocks to Gutenberg, such as advanced headings, Google Maps, timelines, reviews, share buttons, icons, extensive columns and more. Gutenberg is also continuously developed by the WordPress Core team and a front-end editor for Gutenberg might be something for the future. 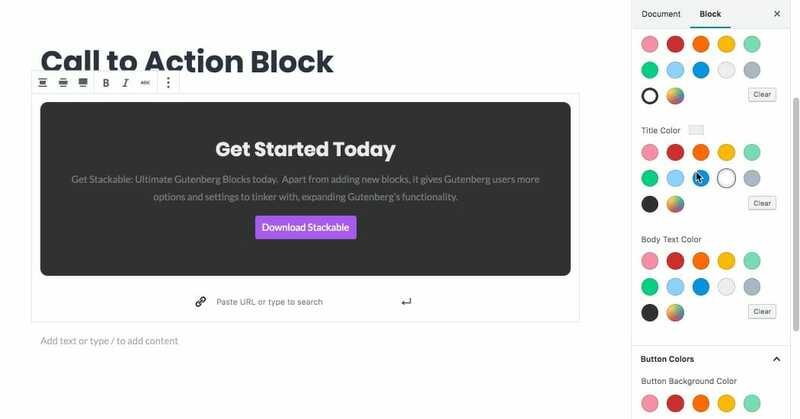 An example: the plugin Stackable – Gutenberg Blocks adds many blocks, such as a Call To Action block. At Savvii we look forward to Gutenberg. A well-functioning Gutenberg editor means less external plugins to add missing features. The fewer external plugins, the fewer security risks, and the faster websites load. WordPress has to be accessible to the wider public, but also to agencies. These agencies won’t switch now from page builders to Gutenberg, but this scenario is not unthinkable for the future. If Gutenberg becomes more stable, gains more content blocks and becomes a front-end editor, then Gutenberg can truly form a large danger for WordPress page builders. The interesting (and great!) thing about a new editor is the fact that the existing page builders will have to work hard to stay ahead of Gutenberg. Many developments can be expected from both sides in the coming years – something that’s great for the users of WordPress. How does the WordPress community react to Gutenberg? When Gutenberg became available for the first time to the greater public, there was a lot of commotion. The new content editor was full of errors and people didn’t understand why the current editor had to be replaced, and especially not why Gutenberg had to become the replacement. The plugin received thousands of negative reviews on WordPress.org and countless WordPress blogs gave their uncensored opinion. The WordPress community was not very enthusiastic, how about the other important players? A lot has been written about Gutenberg and page builders, but it’s interesting to look at some large names within the WordPress world. We start with Matt Mullenweg, owner of Automattic. He isn’t completely objective: there are people who doubt the motivations of Automattic to implement Gutenberg within WordPress. This is the project that Matt is heavily involved with. The arrival of Gutenberg is seen by some as an attack on the page builders by Automattic, who wants to take over a market share of the page builders. Nonetheless, it’s still good to consider his reasoning, so we have placed him at the top of the list of WordPress experts. Matt Mullenweg stood by his viewpoint: Gutenberg had to come. In the recent debate about Gutenberg readiness, I think it’s important to understand the difference between Gutenberg being ready code-wise (it is now), and whether the entire community is ready for Gutenberg. He raises a good point: as always with new technology, there is resistance. The existing group of users is forced to adapt and resists. Months after the launch of Gutenberg the community seems to support Gutenberg more and more. Every day bugs are solved, new blocks are added by independent developers and WordPress themes are released that support Gutenberg. If the goal was purely to benefit Automattic it would have been faster, easier and created an advantage for Automattic to have Gutenberg just on WP.com. That wasn’t, and isn’t, the point. Iain Poulson is the founder of Delicious Brains, the company behind the popular WordPress plugins WP Migrate DB Pro, WP Offload Media, and WP Offload SES. Although he thinks it’s a well-written plugin, he thinks that Gutenberg doesn’t belong in WordPress and he doubts the motivations of Automattic. Ian doesn’t think that Gutenberg comes near the abilities of page builders. Read his opinion column for more context. I’m hugely impressed with what the Gutenberg team have accomplished so far and look forward to seeing it improve. However, I can’t help feeling that other parts of WordPress are suffering because of the drive to implement Gutenberg, and I hope perhaps full-time Automatticians are similarly assigned to other much-needed parts of core development. It would be great to see WordPress pushed forward with more than just Gutenberg in 2018. Brenda Barron is a respected editorial member of WPMU Dev and has written a lot about WordPress. She has extensively tested Gutenberg and isn’t convinced that Gutenberg should be added to the WordPress Core. You can find her opinion column on the WPMU Dev blog. While the developers working on the Gutenberg editor plugin has obviously put a lot of work into creating the plugin and I commend them on their efforts so far, the truth is, this plugin is nowhere near ready to be included in WordPress and needs a lot more work, in particular, UX work. Chris Lema is a highly respected name in the WordPress (and marketing) community. He wrote at the beginning of December an opinion column about Gutenberg in which he indicated that he didn’t understand the goal of Gutenberg. He sees Gutenberg like a “mid-flight engine change” and thinks that the community shouldn’t view Gutenberg as a new content editor, but rather as a new engine for WordPress. All in all: Chris isn’t convinced of the importance of Gutenberg compared to the powerful page builders that are available now. The companies behind the page builders that are popular now are not looking forward to giving a public reaction to Gutenberg. It’s an exciting time: if they now argue firmly against Gutenberg and the editor becomes popular in the long term, that could damage the reputation of the page builders. Beaver Builder has written an extensive article about page builders and Gutenberg, but Visual Composer, for example, has ignored the topic. Without a doubt one of the most popular WordPress page builders of the moment: Beaver Builder. In an extensive article (where a lot of discussions ensued in the comment section) the team said that they aren’t afraid of Gutenberg and that they actually support the initiative. Beaver Builder is working on integration with Gutenberg and thinks that there will always be a need that Gutenberg can’t fulfill. Elegant Themes is careful with opinion columns. They have written a few articles about how they support Gutenberg, but in reality, this means a “Switch to Divi” button in the Gutenberg editor. Elementor is a page builder that’s rapidly growing. Users praise this (free) page builder and Elementor is known as a company with a positive attitude towards the developments of WordPress. It was still surprising to read the reaction of Elementor to Gutenberg: they weren’t just really enthusiastic, they integrated Gutenberg very extensively with the Elementor page builder. Elementor Blocks are Elementor blocks, available for Gutenberg! Many Elementor elements are available in the Gutenberg editor through a new plugin, Elementor Blocks for Gutenberg, which is how the Elementor page builder essentially “supports” Gutenberg. An interesting approach that we haven’t (yet) seen with other page builders! All in all: Elementor doesn’t see Gutenberg as a threat and tries to bundle their powers. The Elementor Blocks for Gutenberg plugin is a great initiative that fits that vision. Large names within the WordPress community don’t seem convinced. There is doubt about the motivations of Automattic to add Gutenberg to the Core, and whether Gutenberg should be competing with the popular page builders. At the same time, these page builders are also careful with their opinion about Gutenberg. The role that page builders can play within the world of WordPress Gutenberg is also not fully clear yet. A lot can be said about the launch of Gutenberg (which was added to WordPress around the Christmas holidays of 2018). Despite all the fuss and negative reviews Gutenberg seems stable now and ready for the future. Gutenberg is still young and is called “version 1.0” by many people. This is partly due to the many bugs that were in the release version. Gutenberg is nowhere near finished, and neither are its features. In the long term, Gutenberg needs to be used to design a full website! New WordPress.org directory to discover and install new blocks more easily. When these features are added to Gutenberg, the plugin will be a step closer to the features of current page builders. But we are nowhere near that point yet. Even with the features above added, the large page builders can do many more things. It will be an interesting battle between Gutenberg and the (larger) page builders. We think that for now, Gutenberg won’t mean the end of WordPress page builders! Jelle co-founded the well-known Dutch WordPress blog WPLounge and wrote a book about WordPress. He works daily for various organizations on various online projects and still likes to write about WordPress!